Pink hair has been adored for years now – particularly in fashion. If Instagram proves anything with its streams of iconic women like Brigitte Bardot and Twiggy with photoshopped hairstyles in hues of sticky sweet cotton candy and deep fuchsia, the trend is not going anywhere soon; it’s simply evolving. 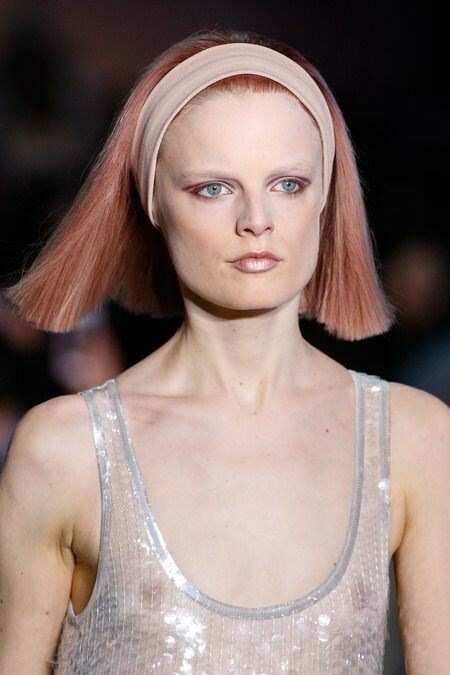 The runway has had a long-standing love affair with the colour since the 90s, when Kate Moss walked for Versace with a head of salmon strands. 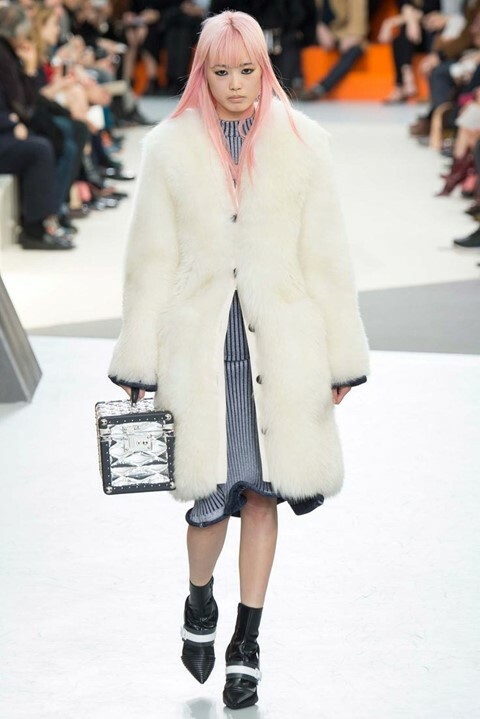 Recently, newcomer Fernanda Ly walked at Louis Vuitton A/W15 with a striking cascade of candy coloured hair and stole the show. Kate Moss specifically dyed her hair a bright shade of salmon pink for Versace’s S/S99 show. Worn pin-straight with a deep centre part and minimal makeup, the colour contrasted beautifully against Donatella Versace’s bodycon dresses and skirts rendered in pastel colours. One of the most iconic photos of Kate Moss remains the image of her tucked in bed under the covers with faded pink hair, photographed by Juergen Teller a short time afterwards. As Laura Bradley previously explored, designer Rei Kawakubo frequently indulges in a pink colour palette set against a sea of blacks. Kawakubo’s pinks come heavily textured and sculptural – rough around the edges and free of the femininity that is often associated with the colour. 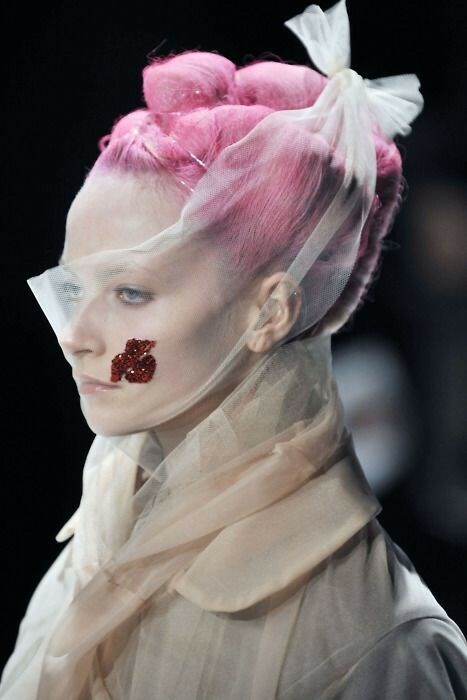 This particular updo in the A/W09 collection showed Kawakubo’s brilliant creative direction; the fuchsia ‘do, woven in separate mounds, took on its form with a delicate piece of tulle wrapped around it. The hair on the runway at Meadham Kirchhoff’s S/S11 was a mix of colours, worn parted to the centre with low-slung pigtails. Deep fuchsia faded to orange on one side, while navy blue faded to green on the other, resulting in a watercolour effect. It was a great moment for hair colour overall, but with the Courtney Love-inspired babydolls and acid wash denim jackets, it was a glorious interpretation of 90s grunge modernised for the 21st century. 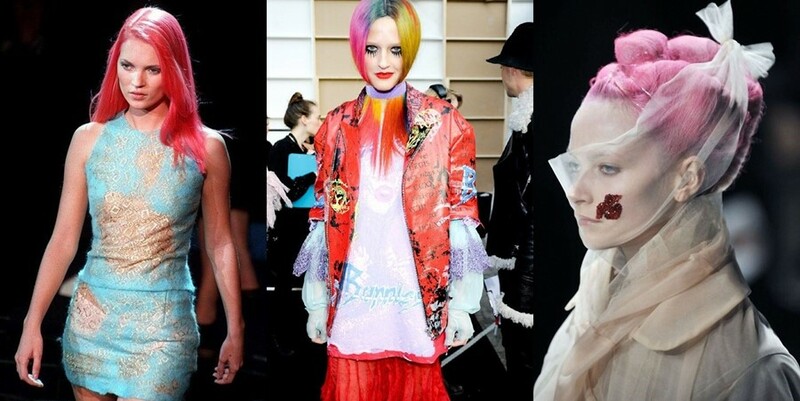 Ever since she was 15, model Charlotte Free has been dying her hair pink, and it has since become one of her trademarks, featuring in shows from Vivienne Westwood to Chanel. 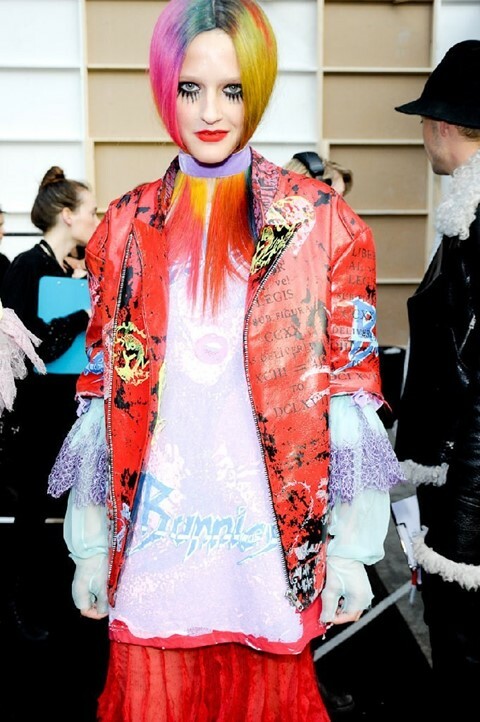 But it is the sky-high, 90s club kid pigtails seen at Jeremy Scott A/W11 that is her strongest pink look. 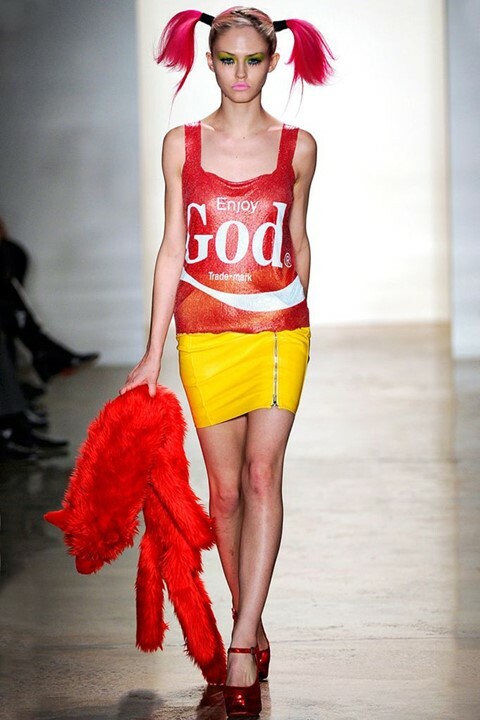 The aesthetic for the collection was part anime, part pop star, and she opened the show wearing a tee that mimicked a classic Coca Cola can but given a wry twist typical of Scott's commentary on consumer culture.